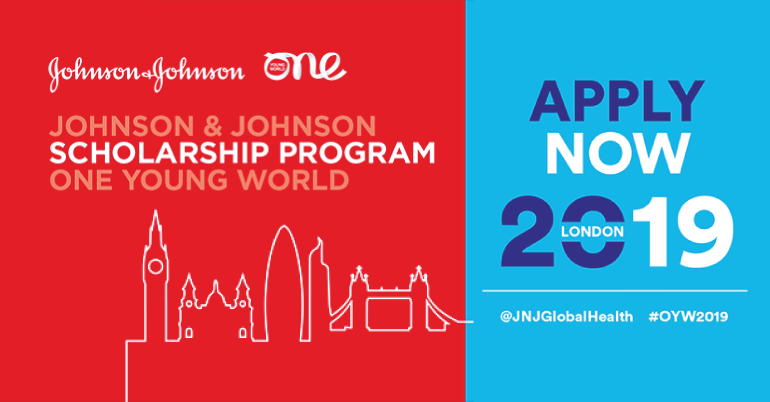 Johnson & Johnson with One Young World, is collaborating to offer scholarships to attend The One Young World 2019 in London to 12 young health leaders across the globe to participate in the 2019 Johnson & Johnson One Young World Program. At Johnson & Johnson, it is believed that good health is the foundation of vibrant lives, thriving communities and forward progress. That’s why for more than 130 years, they have aimed to keep people well at every age and every stage of life. Today, as the world’s largest and most broadly-based healthcare company, they are committed to using their reach and size for good. They strive to improve access and affordability, create healthier communities, and put a healthy mind, body and environment within reach of everyone, everywhere. Every day, more than 130,000 employees from Johnson & Johnson across the world are blending heart, science and ingenuity to profoundly change the trajectory of health for humanity. For the third year running, Johnson & Johnson Global Community Impact, the team who leads the global partnership for Johnson & Johnson with OYW, is collaborating with OYW to offer scholarships to 12 young health leaders across the globe to participate in the 2019 Johnson & Johnson One Young World Program. The Johnson & Johnson Global Community Impact team supports and champions people on the frontlines who are at the heart of delivering care. The team believes that changing the trajectory of health for humanity requires putting people first so that communities and health systems have the ability to address the health needs of the world’s most vulnerable people. Through its global and community-based partnerships and programs, the Team aims to support the next generation of global and community-based health leaders to develop the skills and tools they need to drive health and well-being in underserved communities. As well as attending the upcoming 2019 One Young World Summit, scholarship recipients will receive individual coaching from senior Johnson & Johnson executives to further develop their aspiration, strategy and/or initiatives. In addition, all J&J OYW scholars are buddied with a team of 2019 J&J delegates over the course of the six-month program to help build and strengthen the capacity of the Scholar, through the sharing of their skills and knowledge. The Johnson & Johnson One Young World Scholarship Program runs from September 2019 – February 2020. All scholar recipients will be expected to invest 10% of their time in this program and to attend regular Johnson & Johnson webinars and calls. Applicants must be working on the front lines of delivering care and dedicated to health and care giving to underserved populations and communities. You can be a nurse, midwife, community health worker, a doctor, a social entrepreneur, a digital health expert, or working for a social enterprise, medical facility and/or a nongovernmental organization. If selected, Health Care Professionals classified as Government Officials within their home country will need approval from their employer and may be required to undergo an additional health care compliance approval process by Johnson & Johnson before their scholarship can be confirmed.